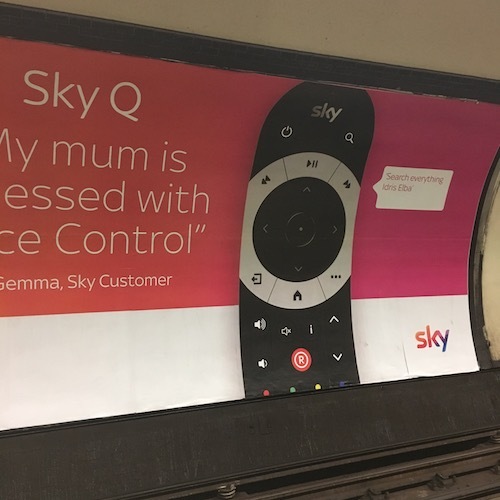 Sky Remote With Voice Control. Spotted this on the Tube. The ad says “My mon is obsessed with Voice Control.” Can you see where is voice control button? I couldn’t find it so I made this picture. I found full remote picture and still could not find the button. Turns out, the voice control button is on the side. They couldn’t find space to put it on the front? I don’t think my mon would ever be able to find voice button on this remote. While Apple TV remote has many flaws, at least it has obvious voice control button. It embraces voice for everything, so there’s no search button because you can search with voice. If I would have to design this remote, I would remove most of the buttons and replace search button with voice control. When I bought my first MacBook Pro, I fell in love with white Apple remote because it had almost no buttons and was so inviting. I am glad modern Apple TV remote inhereted this simplicity.